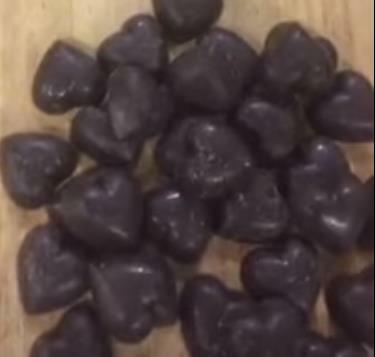 1.44 ounces of HOLY HEMP Chocolate contains 5 mg of RAW non-decarboxylated CBD(a). CBD or cannabidiol is a non-psychoactive compound found in the hemp plant family that is: a potent antioxidant, a neuroprotective molecule, a positive influence on the immune system, and assists the body to improve blood flow. 1. Raw chocolate contains healthy oils. CBD is an oil-based, lipophilic molecule that is best delivered in foods rich in healthy oils. 2. Theobromine, the major xanthine alkaloid and caffeine-relative in chocolate, is a known vasodilator that acts as a “driver” of nutrients such as CBD into the system. 3. Chocolate contains two compounds: N-oleolethanolamine (OEA), a known inhibitor of weight gain in mice, and N-linoleoylethanolamine (18:3 NAE), a known anti-inflammatory molecule via the TRPV1 receptor). These two molecules appear to inhibit the early breakdown of CBD during digestion. This allows the CBD molecules to stick around longer, providing even more benefits (as if one had taken more CBD). Holy Hemp includes whole hemp seed and salt sprinkled on top! 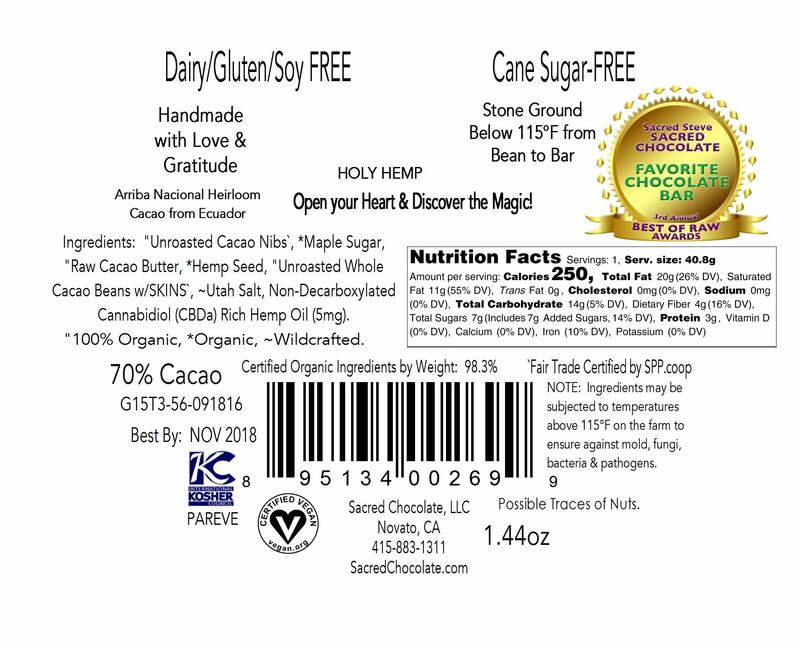 "Cacao Nibs, *Maple Sugar, "Cacao Butter, *Hemp Seed, "Whole Cacao Beans with SKINS, ~Himalayan Pink Crystal Salt, ~Utah Salt, Non-Decarboxylated Cannabidiol (CBDa) Rich Hemp Oil (5mg). "100% Organic, *Organic, ~Wild Crafted. Note: This chocolate has not yet been certified organic by CCOF. However, we are using the same organic ingredients that are being used in our certified organic bars.